Whether your association is competing to hire staff or is running a membership drive, your success rates with both depend largely on how your organization is perceived by your audience. And how they perceive has a lot to do with your organization's branding. The bread and butter of any association are its members. While it is equally important to ensure your staff is set up for success, strong, positive feedback from your members is what ultimately dictates and drives success for your association. Should Your Focus be on Recruitment or Retention? We continue to try and recruit new members and grow our associations as well as face as the ongoing challenge of engaging current members. Whereas recruiting new members is important to the development of the club, how important is it to retain current members? One of the best things you can do to increase traction and trust with your members is to create a powerful user community, which helps maximize the value members get from your association. When you combine deep analytics with insight into your membership, you can make informed, powerful decisions that will maximize membership engagement. But, how can you turn analytics into more engaging interactions, content and relationships? Engaged members are more satisfied, see value in their membership, and participate in more activities. But, how do you create an experience that’s truly meaningful to your members? You and your organization rely on the smooth flow of communication between members to share important information. If your emails are being blocked or identified as spam, it creates a disconnect in your organization because important details may be missed. We often see associations apply a number of strategies to recruit members only to see their retention levels decline. More often than not, it’s the new members that joined in the last year that decide to leave the organization. As a member-centric association, you dedicate a lot of your time on recruitment activities, and in a digital world, you have to start where your audience is – online. Follow these best practices to make a great impression online. Did you know that you only have 5 seconds to capture the attention of your website visitor, and that once they leave, the chances of re-engaging are very low. Here are 5 tips to engage your visitors right away, and keep them coming back. Your website is your public face and it is what defines your association to potential members and the community. Don't miss out on potential new members by ensuring you follow these effective design practices to encourage visitors to take action. Get insights and ideas on how to become a more member-centric association. Right to your inbox, twice a month. 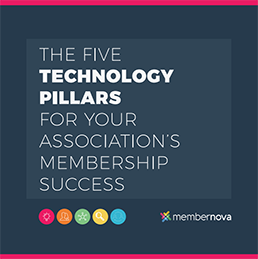 How does your association measure up to these 5 technology pillars? Ready to become a more member-centric association? Today's members demand a modern, intuitive experience from their association. We understand the member's perspective and that's what drives us to be the only AMS that puts you in the driver's seat to improve engagement, social connections and membership success.